This year, more than70 representatives of a total of 14 countries, including Bulgaria, Greece, Poland, China, France, Germany, Italy, Sweden, the United Kingdom and the United States took part in the event. The CMDR COE was honoured to welcome representatives of the United Nations Office for the Coordination of Humanitarian Affairs – OCHA; NATO HQ; SACT HQ; NATO Defence College; NATO COEs (Modelling and Simulation, Energy Security, Military Medical); Hellenic National Defense General Staff; US Agency for International Development – Office of US Foreign Disaster Assistance; 77th Brigade, Force Troops Command, British Army; Bundeswehr Office for Defense Planning; BGR Ministry of Defence; Rakovski National Defence College; the National Military University Vasil Levski; Bulgarian Universities (Sofia university, University for national and World Economy); National Institute of Geophysics, Geodesy and Geography; Bulgarian Academy of Sciences, as well as business and Industry representatives. – Building societal resiliency and mitigating vulnerability. The conference opening address was delivered by the Deputy Minister of Defence of the Republic of Bulgaria Mr. Atanas Zapryanov. Mr. Zapryanov expressed his satisfaction at the fact that the CMDR COE annual conference has become a successful mechanism for exchanging ideas and recommendations on key issues in crisis management and disaster response, as well as for developing good cooperation between the actors involved in the process. 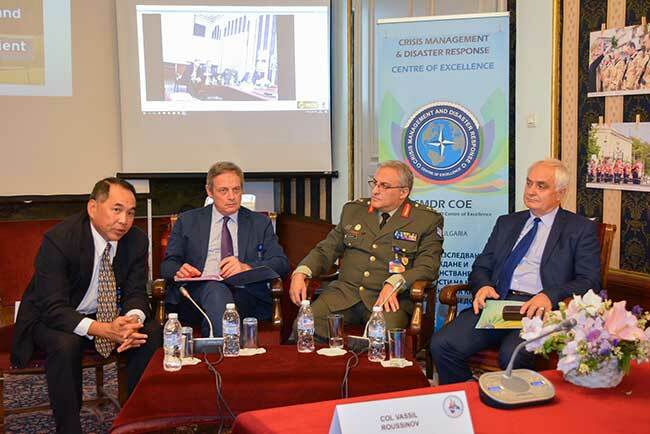 The Deputy Minister of Defence highlighted the role of CMDR COE as a strategic asset for Bulgaria, as well as for the Alliance, adding that the Centre works successfully in close cooperation with NATO and EU structures and contributes to enhancing interoperability through research, analyses, lessons learned and information sharing. The opening address of the Deputy Minister of Defence of the Republic of Bulgaria was followed by the welcome speech of the CMDR COE Director, COL Vassil Roussinov who noted that the aim of the 5th CMDR COE Annual Conference was to bring out organisational or personal experiences of good practices and lessons learned from either national or international institutional arrangements that seek to increase comprehensiveness and cooperation between institutions operating in the context of the crisis management and disaster response. The keynote speakers at the Interagency Interaction in Crisis Management and Disaster Response conference were RADM US NAVY Pete A. Gumataotao, Deputy Chief of Staff, Strategic Plans and Policy in Supreme Allied Command Transformation (SACT) and FOGO champion; BG Konstantinos Alexopoulos, Director of A6 Directorate (Civil Defence, CIMIC and Civil Emergency Planning) of Hellenic National Defence General Staff and the Chairman of the Coordinating Committee of the Multinational CIMIC Group, and Mr. Jean-Dominique Dulière Head of Crisis Responses and Exercises Section in NATO HQ, Brussels. The productive work and lively discussions throughout the two-day event have led to achieving the main objectives of the CMDR COE annual conference, including the dissemination of knowledge concerning Lessons Identified/Lessons Learned in disasters relief and humanitarian assistance, consequence management and the ways of mitigation the effects of the natural and manmade calamities, as well as exchanging ideas among the members of the crisis management community of interest, providing opportunity for the researchers to present their work and share experience with other actors in the same field, and sharing data and facilitating cooperation between research institutes and governmental organisations.